Stoner Invisible Glass Clean & Repel brings together the two most important steps in glass detailing – cleaning and protecting. The superior cleaning leaves behind a crystal clear finish, while the built-in repellent leaves behind a layer of protection against rain, water, snow, and sleet. Instead of using three different products for the best glass finish, use Stoner Invisible Glass Clean & Repel for both cleaning and protection! 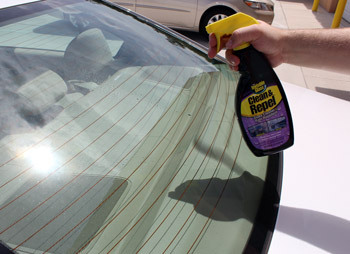 Clean and clear glass may be the most important aspect of detailing a car. Forgetting all aesthetic reasons, if your glass is foggy, waterspotted, or simply not sealed against the elements, you are putting both yourself and your passengers in danger. Stoner Invisible Glass Clean & Repel safeguards your trip by sealing your glass. This creates a high surface tension that makes water roll right off, rather than sticking and impairing your vision. In addition to protection against water, Stoner Invisible Glass Clean & Repel makes it harder for salt spray, road dirt, bugs, bird droppings, and road grime from sticking to the surface. And if any of those do stick? Use Stoner Invisible Glass Clean & Repel to clean them off! As Stoner Invisible Glass Clean & Repel is a two-in-one product, you won’t need to remove and reapply this glass sealant every time the product is used. In fact, when cleaning with Stoner Invisible Glass Clean & Repel you are actually strengthening your sealant by applying another layer. Spray Stoner Invisible Glass Clean & Repel directly onto the glass you wish to clean and protect. The specialized repellent used in Stoner Invisible Glass Clean & Repel helps your wiper blades efficiency by promoting a smooth and clean surface. This one-step product greatly improves visibility in wet weather after just one use. Simply spray Stoner Invisible Glass Clean & Repel directly onto the surface, and gently wipe-off using a clean microfiber towel. We recommend using the Waffle Weave Glass Cleaning Towel, as it’s specifically made to leave a streak-free finish. Stoner Invisible Glass Clean & Repel is safe for use on tinted windows. The product description did not do this product justice!!!! This doesn't clean all that well, so I usually use a separate window cleaner and use this for rain repellancy. It works well in that regard, but only for about a week. If you only have a few minutes to apply, it works ok. I would rate it higher if it cleaner better and lasted longer. I have tried various cleaners and techniques for getting glass clean, streak-free and remove water spots on cars and glass/mirrors around the house. 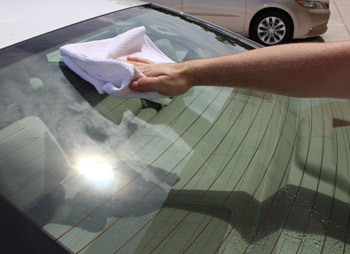 White vinegar on a towel seems best (not perfect) for water-spots, and waxing car windows is ok. But for all around bug removal and reduced-streak results, Invisible Glass and crumpled newspaper has all the other traditional (Windex) cleaners beat. Per 3-M, it is also one of the few spray cleaners safe for use on their window films. Fantastic product to keep glass clean and water beading away. When used with a clean microfiber cloth it's excellent and far superior to any other product I've ever used on glass. It's easy on the wallet as well! it cleans glass..but it's claims of rain repellant I do not agree. I even applied the suggested 2 coats. I tried this on both my Camaros. My 97 Camaro's windows are weathered and hoped this stuff would help clear them up..
as there is no mention if this product is safe for plastic. Consproduct needs to say weather or not it can be used on plastic windshields, plastic in general.